One tiny company holds the key to this $1.2 trillion energy revolution. And investing in it could show you 1,587% profits! We now hold the key to one of the biggest energy breakthroughs in history. Enough energy to power the ENTIRE PLANET for millions of years! This energy source produces zero emissions. It comes from the most abundant resource in the known universe. And incredibly, it can be used for anything. It can even power the ENTIRE U.S. electrical grid. It’s more efficient than solar, wind, lithium, geothermal, or any other alternative energy source you could think of. In fact, it’s positioned to become the No. 1 source of energy on the planet, surpassing coal, oil, and natural gas. The Department of Energy (DOE) just announced $39 million in funding for research and development (R & D) in this sector. And the U.S. Army has partnered with Chevrolet to build a new generation of stealth Humvees powered by this energy. Japan has already committed more than $300 million to use this fuel to power the 2020 Tokyo Olympics. But it’s not only governments pursuing this endless source of clean energy. Almost every Fortune 500 company that you can think of is jumping on board, too. Google is already using this energy to power one of its data centers. Apple is investing more than $1 billion so it can do the same. Anheuser-Busch is building a fleet of almost 1,000 semitrucks that are powered by this clean energy source. Yahoo, Verizon, Target, eBay, Sprint, Comcast, FedEx, and Nokia are all throwing their hats in the ring. And that’s still only a handful of the companies with skin in the game. There are dozens of other Fortune 500 companies that are in an all-out race to take advantage of endless clean energy. But if I told you about all of them right now, we'd be here all day. The takeaway is that they all share a singular goal: to be the first to make billions from "endless clean energy." According to data from the Energy Information Administration (EIA), we could see more than $1 trillion pouring into endless clean energy. Alternative energy only makes up about 10% of the energy market so far. But we’re approaching a critical tipping point. Major companies like Google, Apple, Amazon, Yahoo, Verizon, Sprint, FedEx, General Motors, Walmart, and many more are investing billions in alternative energy. Google, Facebook, Apple, Amazon, and Samsung have all promised shareholders that they will switch to 100% alternative energy, some as early as 2020. And that makes this endless clean energy source extremely appealing to them. It can lower their operational costs by billions of dollars and create a positive, environmentally friendly public image at the same time. It’s a pure win-win situation. Alternative energy already powers more than 40% of Amazon’s operations. That's about the same amount of energy needed to power 122,000 homes! And Amazon currently uses clean energy to power thousands of pieces of equipment across its factories and warehouses. Walmart started using this fuel to power 22 of its stores and distribution centers. And it was so cost-effective that the retail giant decided to bring 30 more locations on line immediately. “This technology is very, very disruptive, and we're investing a lot of time and money into it,” reports Microsoft. They stand to make obscene amounts of cash. And there's one company positioned to get the lion’s share of their business. The company is quickly breaking away from its competitors. It's snapping up multimillion-dollar contracts left and right. Its clients include the U.S. Navy, the U.S. Army, Audi, Siemens, and Royal Caribbean Cruises — to name a few. 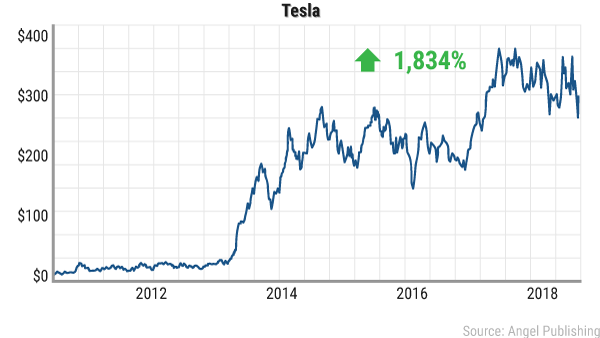 Between these impressive government and corporate partnerships and the frenzy of Fortune 500 companies adopting this new energy source, this stock could easily shoot up five times, 10 times, and even 15 times from where it is today! And in a minute, I’ll tell you all about it. Endless clean energy has been sought after for decades. Fossil fuels are dirty and expensive and have become increasingly scarcer. Scientists have spent decades looking for an alternative. But none have ever even come close to the stunning breakthrough made by Scott Grendahl and his team at the end of 2017! “There are other researchers who have been searching their whole lives [for this],” says Grendahl, the lead researcher behind the breakthrough. But what was once purely a laboratory experiment now promises to become the most efficient and cheapest source of alternative energy. This is hands down one of the biggest energy advancements in human history, like the discovery of gasoline or nuclear power. According to the EIA, the U.S. consumes about 142 billion gallons of gasoline a year. That's almost half a trillion dollars worth. And clean energy could replace every single drop of it! And that’s because it can be used to power cars more easily than just about anything else. But it’s so universal that it’s poised to disrupt every aspect of the $1.2 trillion energy industry. And that’s just in the U.S. alone! Most people won’t know anything about this new fuel source until they hear about it on the evening news. But by then, they'll have already missed out on the huge profits earned by those who got on board early. I'm the lead energy analyst here at Angel Publishing. I bring high-caliber, profit-gushing energy investments to my hundreds of thousands of daily readers before the mainstream media catches on. I was among the first to break news about Bakken oil plays to our readers back in 2007. This was back when no one could imagine that North Dakota held more oil than any OPEC member nation. I visited the wells, spoke with the experts involved, and racked up a string of triple-digit gains from the Bakken. I was one of the first investors to move into the massive shale gas deposit in the Marcellus Formation. This was years before it became a Wall Street media darling in 2011. I've even road-tripped to the oil sands in Alberta and met with high-powered energy executives. And that led us to gains of 103% on Petrobank Energy and Resources and 85% on Canadian Superior Energy. In short, I’ve spent the better part of the last decade doing boots-on-the-ground research to bring you the inside scoop on the biggest energy plays before Wall Street and big banks catch wind of them. But as impressive as they are, the profits that my readers raked in from those oil plays look like peanuts compared to the profits coming from clean energy. Advancements in wind, solar, geothermal, and lithium have all contributed to the rise of the $120 billion alternative energy industry. 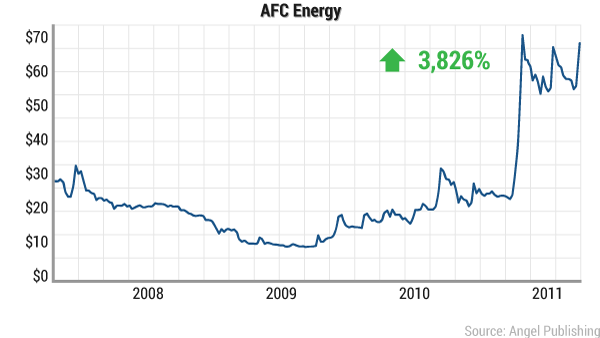 Simply put, when an energy sector has a major breakthrough, smart investors who got on board early get rich. 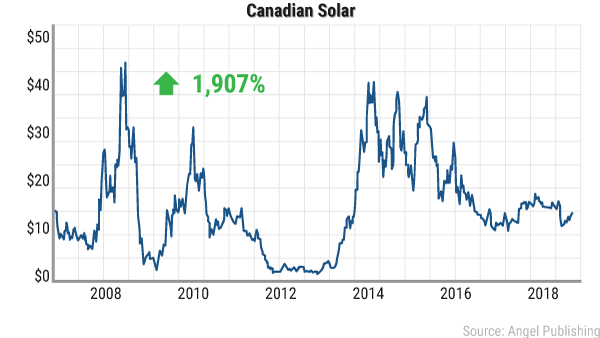 Companies like Canadian Solar, Vestas, and Tesla have proven that alternative energy is a veritable gold mine for investors. And thanks to this discovery, there’s one tiny engineering firm that stands to become bigger than Tesla, Canadian Solar, and Vestas — COMBINED! It plays a key role in the coming mass adoption of this incredible fuel source. In fact, it already makes the engines that run on clean energy. And those engines could render Tesla’s engines obsolete. Whether you’re an environmentalist or not, there are still billions of dollars flying thick and fast in this market. And that kind of profit opportunity warrants your attention. Army Scientists Make World-Changing Discovery... By Accident?! Incredibly, this discovery didn't come from scientists engaged in energy research. The scientists in question were developing an ultra-strong and lightweight metal alloy. They had no idea that their experiments would lead to a game-changing discovery of this magnitude. 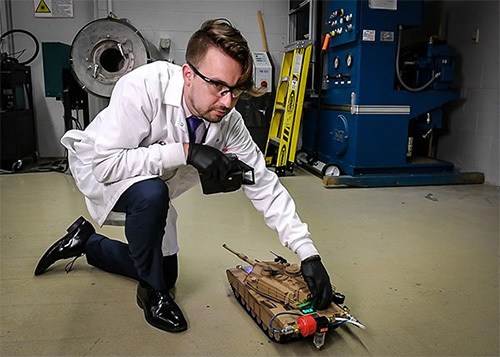 You see, when they were stress testing the new alloy, the research team planned to see how it reacted to different environments and chemicals that it might come into contact with. A reaction occurred that no one expected. The chemical that caused it? H20, also known as regular ol' drinking water! The most abundant resource in the known universe is the source of clean energy. The properties of the metal caused the water molecules to split, which created hydrogen and oxygen gas. And hydrogen gas is what powers hydrogen fuel cells — the quiet, clean engines of the future. Fuel cells can power anything that a traditional engine or motor can: cars, boats, trains, drones, and even houses and factories! There have been many attempts to harness hydrogen power in the past. But no one has ever split water molecules with such ease. According to the man behind the discovery, Scott Grendahl, previous attempts to do so weren't even half as effective. And what’s more, it could take several hours to generate the amount of energy that his team produced in less than three minutes. 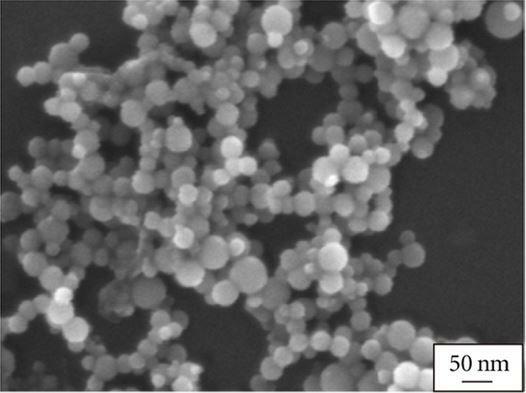 For the first time, creating hydrogen power is efficient, fast, and cheap. Point blank, all it takes to create clean energy is to pour water over metal. It’s so easy, a child could do it. Instead of filling gas cans, you’ll be filling rain barrels. You'll never again have to handle the foul-smelling, highly flammable fuel that we rely so heavily on today. And the car that uses hydrogen gas to power it will be quieter, safer, and more efficient. Governments and megacorporations alike are already wise to it. The U.S. Army is already working with Chevrolet to build a new generation of hydrogen-powered stealth Humvees. Anheuser-Busch is building a fleet of 800 new hydrogen-powered delivery trucks. GM has already invested $2.5 billion in producing hydrogen-powered cars. And the city of Tokyo is spending $300 million on hydrogen-powered shuttles for the 2020 Olympics. This is in addition to building a 6,000 unit Olympic Village that's powered only by hydrogen. Hydrogen could easily become the primary source of fuel in the world. It’s efficient, abundant, and cheaper than ever before. The biggest opportunity in this market is simple. The top company that mass-produces the engines that run on hydrogen stands to make an absolute fortune. And this tiny manufacturing company has already partnered with the U.S. military and several top Fortune 500 companies to achieve that end. It's working with Royal Caribbean Cruises on futuristic new cruise ship engines. The U.S. Navy has commissioned the company to develop 13 new propulsion systems for its drones. The U.S. Army recently ordered $1 million worth of mobile power packs from it. It's signed a $9 million contract with Siemens to develop a hydrogen-powered train. And Audi signed a three-and-a-half-year development contract with the company to the tune of $100 million! For a small-cap company, these big-name partnerships speak volumes about its potential. It's the clear industry leader in terms of quality. And that quality is a direct result of the incredible leadership behind this industry-leading manufacturer. Its CEO founded and ran a power company for 15 years before he joined this enterprise. Between him, the company's former IBM executive, and its 33-year veteran of Texas Instruments, it has almost a century of combined experience in dealing with new technologies. Getting in on the ground floor with this company is the opportunity of a lifetime. With a market cap of slightly under a billion dollars, it wouldn’t take much for its stock to jump five times, 10 times, or even 15 times its current price! And that could happen before you know it. Hydrogen stocks have been known to spike and spike hard. That’s enough to turn every $1,000 invested into more than $32,000! The best part? All these gargantuan gains happened within the course of two years! What would you do if you made that kind of money? Spend a summer sipping champagne on the beaches of St. Thomas in the U.S. Islands? Remodel your home? Pay your kid’s college tuition? It doesn’t matter which one you choose because you’d be able to do all that and more. The only thing left to do is to join the investors who are already capitalizing on this amazing energy source. You see, this breakthrough is such a big deal that even "Big Oil" is embracing hydrogen power. When solar power became wildly popular, we didn’t see ExxonMobil or Royal Dutch Shell start selling solar batteries. But between rising oil prices and dwindling supplies, energy companies will have to embrace new ideas to survive. And they have no intention of missing out on this red-hot new energy source. So, they're going all in on this one. And Shell joined an international partnership that’s investing $10.7 billion into this new energy. Again, between rising oil prices and dwindling supplies, energy companies will have to embrace new ideas to survive. And even though they skipped every previous alternative energy boom, this is the one that they’ve chosen to go all in on. Big Oil has never invested this kind of money in green technology before. Let’s start with oil. When it started to replace coal as the primary fuel source, it created fortunes the likes of which had never been seen before or since. Oil baron John D. Rockefeller is still considered to be the richest American of all time. He would have been worth approximately $253 billion by today’s standards. And he created the first Big Oil company: Standard Oil Co. It was so obscenely profitable that the U.S. Supreme Court ruled it a monopoly and broke it down into 34 separate entities. These entities became companies like ExxonMobil, Chevron Corporation, and Amoco Corporation — to name a few. 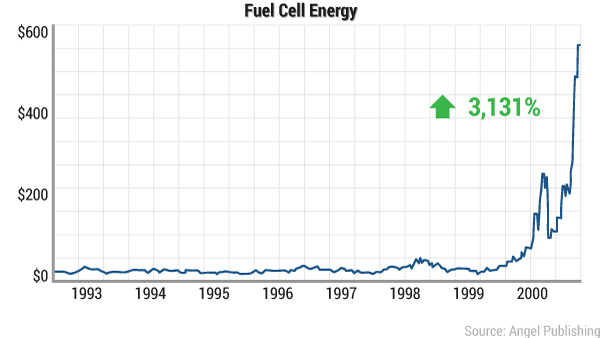 And now, almost a century later, the titans of the oil industry are turning to hydrogen. They're positioning themselves to create new levels of wealth from this energy revolution. 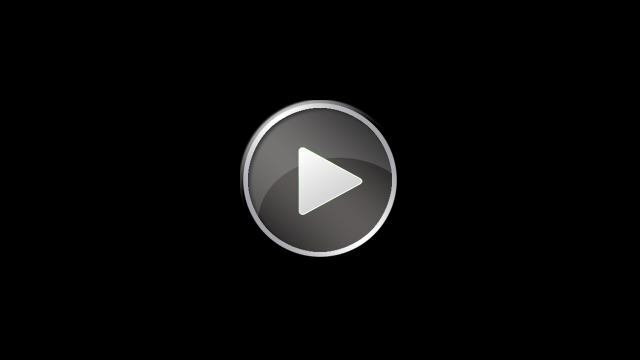 It details the name of the stock and a deep analysis of the company's future growth potential. I'd usually charge $99 for research like this. But today, I’d like to send it to you — completely FREE! You can’t find it anywhere else on the internet; you can only claim it right here, right now. First off, I want to sleep well at night knowing that I made an honest move to put this timely information in your hands. The other reason is that sending you this timely report as soon as possible is just one of the ways that I'll help you in getting your feet wet in the world of cutting-edge energy investments. The simple truth is that the world needs energy more than anything else. Everything we use is powered by it in some form. And with every major energy revolution, vast fortunes are made. It happened during the industrial coal age, during the oil boom after the 1900s, nuclear age in the 1980s, solar in the early 2000s, and lithium-ion batteries in the last decade. Hydrogen is the new oil that will be driving our power needs. And we'll be there to capture the double- and triple-digit gains like we did at the start of the Bakken oil boom in North Dakota. And by joining our investment community today, you'll reap the spoils, too. Besides your free report, “Clean Energy: Harnessing Hydrogen for 1,587% Profits,” I’ll also be by your side every step of the way to help you in capturing the biggest gains of your life. Since 2005, I've been running one of the most profitable energy newsletters in the country: Energy Investor. I've been introducing investors like you to some of the most explosive trends in the energy business. And I do it well before most people have ever even heard of them. When people started talking about the shale oil boom in North Dakota, we'd already taken the lion's share of the profits while the oil was still thick. In fact, I alerted my readers to two tiny oil stocks, Brigham Exploration and Northern Oil and Gas, that ultimately put North Dakota’s Bakken oil field on the map. At the time, these stocks traded for less than $6 and $8 a share, respectively. While Wall Street “gurus” were in the dark, my readers and I watched Northern Oil and Gas spike by 104% within only two months and Brigham Exploration pop 575% within just 16 months. Readers like you netted tens of thousands of dollars from my recommendations. Northern Oil and Gas — 104% within two months. Brigham Exploration Company — 575% within 16 months. UTS Energy Corporation — 141% within 33 months. Dajin Resources Corp. — 200% within eight months. Magellan Petroleum Corporation — 95% within 12 months. Brigham Exploration Company — 315% within 16 months. Petrobank Energy — 103% within six months. Continental Resources — over 60% within three months. 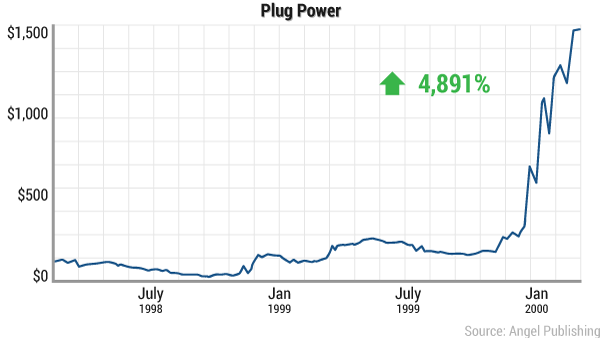 Crescent Point Energy Corp. — 70% within 24 months. American Oil & Gas — 170% within nine months. Petrohawk Energy Corporation — 68% within 23 months. PowerShares DB Crude Oil — 124% within just five months. Canadian Superior Energy — 85% within six months. Gains like these could have made you rich in short order. No doubt, my readers have been milking them for all they're worth. And by becoming a member of our community today, you can, too. "Bought the wife a new car!" "Keith I'd like you to know exactly how much I've appreciated your Bakken coverage over the years. I sold my position on NOG in Feb 2010 for gains of 216%, 1/3 of my position in BEXP in 2011 for gains of 361%, and sold the rest of BEXP in Oct of 2011 for gains of 743%. Now I'm holding a large portion of your newest pick with unrealized gains of 365%. Thank you." "Up 252%, 165%, and 101%." "Just wanted you to know how much I appreciate the hard work you do in finding those great companies for your readers. I am up 252%, 161%, and 101%. You've made a believer of me." "230% in less than a year." "Your insight has been great. 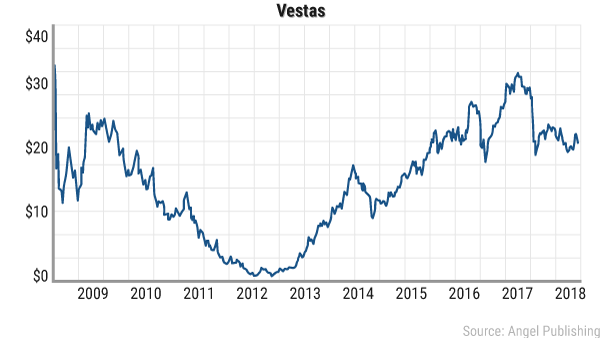 NOG, Gran Terra is up about 230% in less than a year." Is it possible for you to earn this much from my recommendations? But here’s one thing I can say with certainty: The hydrogen boom is shaping up to be bigger than the revolutions in shale oil and gas combined! And I’ll be right by your side to guide you to the biggest gains in this new energy era. This $99 report is yours — absolutely free! 12 Monthly Issues of Energy Investor — You'll receive a full issue in your inbox during the first week of each month. These monthly issues cover in-depth analysis of what's happening in the energy market and also details on my favorite small energy pick for the month. Portfolio Updates — You'll also receive regular updates with up-to-the-minute briefings on my recommendations. All energy trades are regularly revised. And updates are forthcoming, signaling when to buy, hold, or sell. This is to ensure that you'll never have to worry about your trades. I do all the work on your behalf! E-Alerts — These alerts are sent straight to your inbox when an opportunity arises that can't wait until the next monthly issue. In the fast-paced energy sector, opportunities pop up by the hour. With these alerts, you'll never miss a surefire moneymaking opportunity. Customer Support Staff — Should you have any questions or concerns, you can call our support staff at any time and get live help between 9:30 a.m. and 4:30 p.m. (ET). Of course, you'll also have instant access to your free report: "Clean Energy: Harnessing Hydrogen for 1,587%." Bonus Report No. 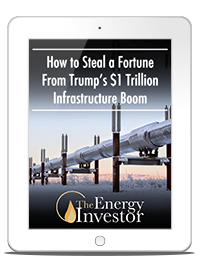 1: "How to Steal a Fortune From Trump’s $1 Trillion Infrastructure Boom," a $79 value — yours FREE. Even though we're gearing up to make a mountain of cash from the hydrogen boom, oil and gas won't disappear overnight. That’s why we won't be losing sight of President Donald Trump’s plan to invest $1 trillion into America’s crumbling infrastructure. And billions of those dollars will go to the development of new oil and gas pipelines over the next four years. The U.S. is in desperate need of more pipelines. America needs over $200 billion worth of new pipelines to accommodate our demand. And a lot of new money is about to flow into the system. And I’ve identified three companies that will be prime beneficiaries while Trump pushes these new deals through. Bonus Report No. 2: "Top 3 'Hidden' Energy Plays Fueling the Marijuana Boom," a $79 value — yours FREE. The legal cannabis sector is actually growing faster than the internet did. It’s expected to hit $21 billion in legal sales in the U.S. by 2020, which isn't bad if you consider that sales only hit $6.7 billion in 2016. Most people don’t realize that the booming marijuana industry is one of the nation’s most energy-intensive. It often demands 24-hour indoor lighting rigs, heating, ventilation, and air-conditioning systems at multiplying growing sites. In California alone, indoor cannabis production uses as much electricity as 1 million homes! And I’ve found three energy companies that stand to benefit the most from the booming marijuana industry’s surging electricity consumption. One of them is a tiny lighting company that growers are relying on more and more. In fact, it recently won the marijuana industry’s Best Lighting Company award. I'd like for you to have immediate access to this opportunity. So, I’m including this $79 report, absolutely free, with your no-risk trial. These reports are your instant gateways to the mega-profits that have yet to come from three of the hottest investing opportunities for 2018. Besides these reports, you'll also have full access to Energy Investor's portfolio and recommendations — many of which are still buys. You'll also have access to past energy reports with the same caliber of insider details. When you get your all-access members-only password, you’ll immediately be able to comb through our website and read past issues and tutorials. Everything is there waiting for you. And rest assured that as we move forward, you'll be the first to hear about any new opportunities I research. So, how much does Energy Investor cost? And how can you get started immediately? But I've asked my publisher to slash this price in half today because I want to ensure that you don't hesitate in securing your free report and your spot while we get in on the ground floor of this hydrogen opportunity. Through this special invitation to Energy Investor, you'll save $100 instantly and pay only $99 for an entire year’s subscription. And everything else I've mentioned, including your three reports, comes free of charge. That’s $456 in services and free gifts for only $99. As I said before, you won't be on the hook for a thing. By agreeing to this offer, you're only agreeing to try Energy Investor. During your six-month trial period, you'll have full membership privileges to Energy Investor. 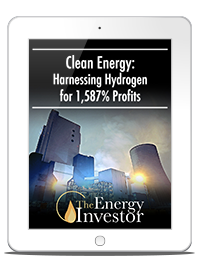 You'll also have immediate access to your free report, "Clean Energy: Harnessing Hydrogen for 1,587% Profits." This report alone carries a $99 value. But again, through this special invitation, it’s yours — absolutely free. "How to Steal a Fortune From Trump’s $1 Trillion Infrastructure Boom," a $79 value — yours FREE. 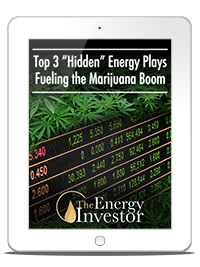 "Top 3 'Hidden' Energy Plays Fueling the Marijuana Boom," a $79 value — yours FREE. 12 monthly issues of Energy Investor. Instant buy and sell alerts. 24-7 access to the Energy Investor members-only website. Take a full six months and put Energy Investor to the test. If you're convinced that you can't make any money with my research, or should you decide that Energy Investor isn't for you, just let me know and you'll get your money back. Keep in mind that your reports, any alerts you receive, and any other intelligence you gather during those six months are yours to keep — even if you decide to cancel. I'm making this arrangement because I'm confident that this service will deliver profits. America is on the cusp of a new energy era. This is a HUGE trend. And it’s here to stay. The profit opportunities are massive and could set you up for the retirement of your dreams. So, if you're interested in trying Energy Investor, I recommend that you start your free trial immediately. Once you sign up, I’ll rush you your free reports because they're time-sensitive and I want to help you get positioned ahead of the crowd. Then you can just sit back and watch your profits piling up as this new energy gathers steam. As a member of Energy Investor, you'll be in a position to know more about how hydrogen will transform our energy needs. And most importantly, you'll take the early round of profits. I'll keep you updated on any information that'll help you make more money in this new energy sector. And yes, this is a young and healthy energy sector. It's only getting started. Believe me, this battle is just heating up. There will be plenty more opportunities in the weeks and months ahead. It would be foolish to sit on the sidelines and watch others getting all the profits while you're left high and dry. I suggest that you sign up right now. Click below to get started. Once again, you'll have six months to test-drive my research. And if you feel that it's not for you, let me know. I'll gladly refund your entire subscription fee. Click here to sign up right now and get in on the ground-level profits that stand to come rolling in.